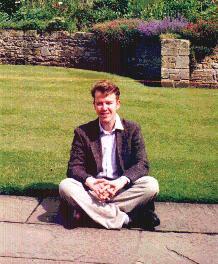 Jonathan Rowson became Scotland's third Grandmaster in 1999 a month after graduating with a first class degree in Politics, Philosophy and Economics from Oxford University. He writes a regular review column for New in Chess Magazine called 'Rowson's Reviews' and his second and third chess books, The Seven Deadly Chess Sins and Chess for Zebras, have been internationally acclaimed and translated into several languages. In 2004 he won the prestigious Hastings Premier and The British Championship- the first Scot to do so for 58 years! He has since won it a further two times making that three in a row! He currently lives in London as a semi-professional player, teacher and writer. He is also a doctoral student in Psychology and Education at Bristol University. I'm Carsten Hansen. I'm 35 years old, a FIDE Master since 1990, Danish, but left Denmark in 1996 in connection with my dayjob in the shipping industry and have since lived in Miami, London, Los Angeles and the last four years just outside New York. I played chess full time in 1991, had some decent results, but not enough to keep at it. So instead I took up writing about chess and have to date had five books published: The Sicilian Accelerated Dragon (Batsford 1998 - out of print, but a new edition is in the works), The Gambit Guide to the English Opening: 1...e5 (Gambit 1999 - recently back in print), The Symmetrical English (Gambit 2000), The Nimzo-Indian: 4 e3 (Gambit 2002) and most recently Improve Your Positional Chess (Gambit 2004). My next book is a collaboration with John Donaldson, an update of his book A Strategic Opening Repertoire (ICE 1997), the new expanded and updated edition is a repertoire book for White based around a set-up where White uses the move order 1 Nf3, 2 c4, 3 Bg2, moves that fall well into what I will be covering in this column. In addition, I have since 1999 penned the Checkpoint column on the popular ChessCafe.com website. In that column, I review new opening books, DVDs, DVD-ROMs, CD-ROMs, magazines and other things. Of the openings we will discussing in this column, I tried most of them, while the English Opening and the Reti have been part of my repertoire for more than 20 years. Therefore any questions you may have or interesting ideas you have come across, please e-mail them with some thoughts of your own to me before you forget it, and I will pick those between those that are most interesting and relevant. Hi, I'm John Watson and I'm not a GM, unlike most of the others on this site. I started chess a bit late at age 13 and, true to my later experiences, I learned from books. They were in fact reasonably advanced books - I never read a beginner's book - and after one year I walked into the Omaha, Nebraska chess club and beat most everyone there! After one tournament my first U.S.C.F. rating was over 2100 and it stayed about there or above from then on. The few dedicated chess players in Omaha had access to just a few regional tournaments a year, so we didn't improve much. But I got lucky and took first place at the initial U.S. National High School Championship. I knew absolutely nothing and relied upon totally unsound tactics to win. Maybe there's a lesson in that: Now I play soundly and lose. I went to Harvard for a couple of years, traveled a lot in strange lands doing odd jobs (sometimes hustling chess), and returned to do some full time work in two factories. I began to play more chess and had some successes. My greatest triumph in that time period was the release of Chessman Comics, co-produced by Chris Hendrickson and self-published at the local copy shop. We ran a business called the Chess House that attracted a number of nice people and a much larger number of mentally disturbed ones! I spent a few years working to become an International Master and wrote my first books (on the English Opening!!) in 1979. As of this date I've written 22 wildly popular books, the majority of which went out of print in less than a year. I've saved a copy of each...I think. In 1988 I managed to complete a degree with honours in Electrical Engineering at the University of California in San Diego and spent five mostly forgettable years working as a Design Engineer specializing in communications algorithms. Upon reviving, I ran away and wrote some more chess books, this time for firms that have fortunately stayed afloat. I've also written many articles and had a bundle of students over the past 30 years. My real interests include my wife, politics, socioeconomic issues, music, eating, sleeping, literature, and my dog (sometimes). I became a professional player in 1983, and have been a Grandmaster since 1990. I have represented England twice, and was Captain of the French team at the Yerevan Olympiad, in Armenia (I didn’t actually play, but they needed someone to get the coffees!) I have written ten books, most recently The Dynamic English, Easy Guide to the Najdorf, The Latvian Lives! and the video/DVD The Knockout Nimzo. I have played the English Opening almost exclusively with White since 1992. Actually, I started playing the English Opening after a summer spent by the Lake Balaton in Hungary. My Hungarian is abysmal (my wife would say ‘non-existent’) and so, as I couldn’t join in many of the conversations, I thought I would study some chess. I looked at my father-in-law’s library and found an old book on the English by Taimanov (in German, I think), and then sat on the veranda, drinking tea and learning the variations. Now, as it happens the theory was somewhat out-of-date, and so I decided that I would pick on a few sidelines, and these served me well when sprung on an unsuspecting chess world some months later. Here are two of my favourite English victories: TK53, TK70.